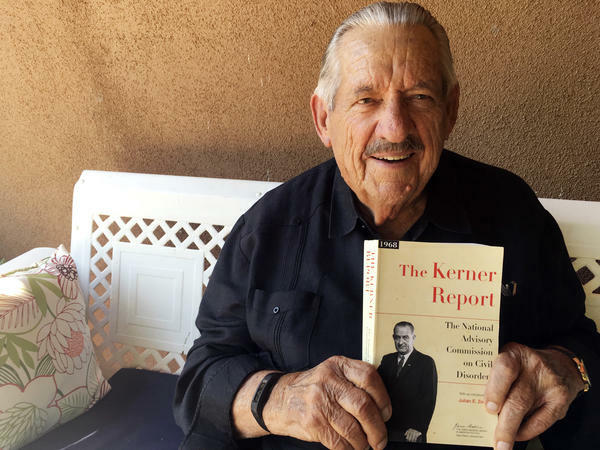 Former Democratic Sen. Fred Harris of Oklahoma, seen in August 2017, holds a copy of The Kerner Report, as he discusses its 50th anniversary. Harris is the last surviving member of the Kerner Commission. Unnerved by the scale of Detroit's unrest, and anxious to find the root causes of the violence, President Lyndon Johnson announced to the nation that he'd convened a new commission, the National Advisory Commission on Civil Disorders. The 11-person group would be headed by Otto Kerner, then governor of Illinois. Its charge: to discover what happened, why it happened and how to prevent it from happening again. The conclusions were dire. Institutional and systemic racism were responsible for many of the ills that beset black America, the report said. The segregated housing, subpar public schools and aggressive policing of black and brown communities could all be traced back to the second-class treatment of America's darker citizens. The nation, the report famously warned, was "moving toward two societies, one black, one white--separate and unequal." The Commission's report was published as a paperback, and became a national best-seller. Virtually no one referred to it by its formal name Report of the National Advisory Commission on Civil Disorders; it simply became the Kerner Report. And while some progress has been made since the report was initially released, a lot of things have gotten worse. A new study that builds on the Kerner Report's work was released this week. Healing Our Divided Society: Investing in America Fifty Years After the Kerner Report was co-edited by Fred Harris (the sole surviving member of the original Commission) and Alan Curtis, CEO of the Milton Eisenhower Foundation. It notes that poverty has increased and so has the inequality gap between white America and Americans who are black, brown and Native American. The gains children of color made when efforts continued to desegregate schools in the 60s began to reverse by 1988. Court decisions that loosened oversight of previously de facto segregated schools resulted in a huge change: In 1988, almost half of all students of color went to majority-white schools. Today that number has plummeted to 20 percent. Poverty is such a problem, the study concluded, that if it is not mitigated, America's very democracy is threatened. "I was 37 when I served on the (Kerner) Commission," Harris told NPR. "Whoever thought that 50 years later, we'd still be talking about the same things? That's kinda sad." Julian E. Zelizer, a history professor at Princeton who has written extensively on the Kerner Commission, said the original report remains germane. "In terms of criminal justice and the way race affects it, I think the findings are so relevant. You could almost take portions of the report, adjust them, obviously, to contemporary times, but they'd still resonate with what we're dealing with today." Zelizer says Johnson wasn't even sure he wanted to convene a panel to study racial unrest. That would be tricky even in the best of times, and those times weren't that. "He's very fearful from the start that the Commission would end up blaming him," Zelizer explained. "And at the same time, they'll say you have to do things that Congress, he knows, will never accept, and he would look bad." After his Herculean effort to pass the Civil Rights Act and the Voting Rights Act, could the architect of The Great Society be remembered instead as the president who bungled race? That possibility was very much on the president's mind. Johnson's trepidation — and his annoyance that his Great Society programs were not credited in the report (members said they didn't want to politicize their findings) — led him to ignore the Kerner Commission. There was no ceremonial handover of the report in the Oval Office or elsewhere, no handshakes, no thank yous. "He refused to meet with us to receive our report," Harris confirms. "And that's particularly sad to me because President Johnson did more against racism and poverty than any president before or since." Peniel Joseph, a University of Texas historian, says Johnson was in a tight spot. The Vietnam war was not going well. Martin Luther King Jr. was preparing to begin several marches that would highlight the poverty of black America. And politicians in his own Democratic Party, such as Minnesota Sen. Eugene McCarthy and, later former Attorney General Robert Kennedy, were making noises about challenging him for the presidency. He felt hounded on all sides. "He was being criticized from his left by people like Dr. King, who was saying all the money he was spending in Vietnam should be spent on antipoverty efforts and racial justice efforts," Joseph says. "And on his right," he continued, "He was being criticized by conservatives who supported the war effort, but rejected the Great Society, and who felt as if the Great Society was justifying law and disorder." So the Kerner Report was put aside, and would soon be eclipsed by the tsunami of historical events that followed that year: King's assassination in April, Robert Kennedy's in June, the train wreck that was the Democratic National Convention in August, with its Chicago street protests and unhinged police violence. Richard Nixon's election campaign that fall centered on a law-and-order platform. But landmark anniversaries have a way of focusing people's attention. The date, the continued attention on problems the Kerner Report focused on (the militarization of police departments, for instance) and the new study may renew people's interest. And maybe enlightened self-interest will help. "Racial and ethnic inequality is still with us," Fred Harris told the Washington Post. "What's happening in the country is bad for all of us. Doing something about it is good for all of us." (SOUNDBITE OF SLEEPDEALER'S "ASTORIA") Transcript provided by NPR, Copyright NPR.